Having a stroke breaks vital connections between your brain and your muscles, which is why it is the leading cause of long-term disability and almost always results in some loss of mobility and movement. However, this loss isn’t necessarily permanent. In fact, rehabilitation is especially crucial during the early stages of recovery, when patients have little to no control over their affected muscles. No matter where you are in your journey toward recovery, your long-term progress will depend on a consistent physical therapy regimen. Learn why physical therapy for strokes is so helpful for stroke survivors, and what to look for as you select a facility and seek out services for stroke survivors. What is the Purpose of Post-Stroke Physical Therapy? Stroke often causes paralysis on one side of the body, which means patients lose function in one arm and one leg. In the first weeks and months of recovery, physical therapists work with stroke survivors to keep these muscles toned and stimulated – even before they regain voluntary movement. If and when function does return, physical therapy allows patients to relearn everyday skills and retrain their healthy brain cells to control the affected body parts. This is part of the various services offered for stroke recovery including occupational therapy, rehabilitation nursing and speech therapy. As soon as oxygen is restored to your brain after stroke, your body and brain begin a long process of recovering from brain damage and loss of muscle function. Post-stroke rehabilitation is a huge part of this recovery process, and it often begins as early as 24 hours after stroke. Stroke physical therapists are able to stimulate affected muscles and nerves to maintain circulation and prevent stiffness, then guide patients through the stages of stroke recovery as they relearn basic muscle movements. Today, many physical therapists specialize in stroke and other types of neurological trauma. These therapists know how to help patients relearn complex bodily movements and avoid complications that could derail their progress later. After stroke, improving your balance, coordination, and other basic skills is essential to your overall quality of life. When Do You Need Physical Therapy? Before you even leave the hospital, you should know which physical therapist or rehabilitation program you want to assist you with your stroke recovery. Your doctors will know what’s best for your body after stroke, so make sure you review all your discharge plans very carefully and consult your medical team about your rehabilitation plan. Your neurologist will refer you to a physical therapy program or rehabilitation facility based on your immediate physical needs and complication risks. Some rehabilitation programs are more rigorous than others, so your ideal therapy setting will depend on your individual symptoms and lifestyle requirements. Motor and sensory impairments are very common after stroke, but your recovery odds increase if you receive the appropriate stimulation and support for your stroke-impaired limbs. Your doctor can help you choose a program and therapist who will work to accommodate your specific degree of disability, overall physical health, age, and other factors that affect your body’s ability to heal. What Happens During Post-Stroke Physical Therapy? Physical therapy for strokes typical have custom plans to fit each individual stroke survivor. During your first appointment with your new therapist, they will thoroughly exam your body, consult your doctor’s notes, and interview you or your loved ones about your symptoms and setbacks so far. This will allow them to develop a plan that’s right for you, focusing on restoring movement and preventing problems that may occur after stroke. Your physical therapy regimen will revolve around specific goals, which you and your therapist will work together to set and work toward. The American Physical Therapy Association (APTA) encourages patients to ask questions, especially about your specific goals and timetable, in order to make sure everyone is on the same page and you know what to expect from physical therapy. For example, physical therapists begin with the most basic tasks and movements, such as safely moving from a bed to a chair while protecting your impaired arms from injury. They will gradually progress to exercises and tasks that improve balance, help you relearn basic coordination skills, and retrain your brain to perform functional tasks such as grasping objects and walking. Your physical therapist may also teach you how to use stroke recovery devices such as the SaeboFlex, a mechanical glove that assists with extension and grasp. 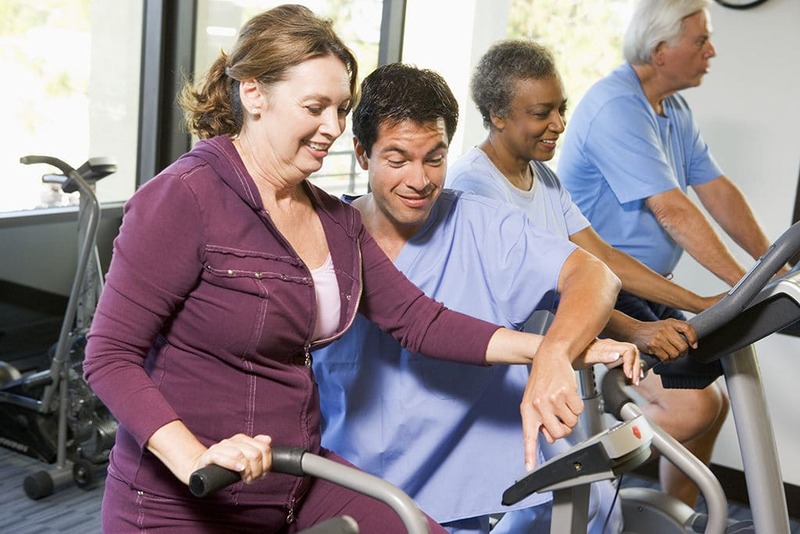 Some stroke rehab programs are inpatient programs and others are outpatient programs. Inpatient programs admit patients to stay overnight, and will assign them rooms to live in during treatment. Outpatient programs provide treatment without requiring that patient’s stay overnight. Outpatient programs allow a stroke survivor who lives at home a full range of services by visiting a hospital outpatient department, outpatient rehabilitation facility, or hospital day program. Stroke survivors with severe impairments may need to stay in a skilled nursing facility where they will receive 24-hour rehabilitation and medical care. The American Heart Association stresses the importance of interdisciplinary inpatient programs, which are intensive and incorporate multiple areas of expertise into patient monitoring and treatment. If you need occupational or physical therapy at least five days a week and three hours a day, you are a good candidate for inpatient rehabilitation. Outpatient therapists see patients for a few hours per day at a hospital-based or free-standing physical therapy facility. 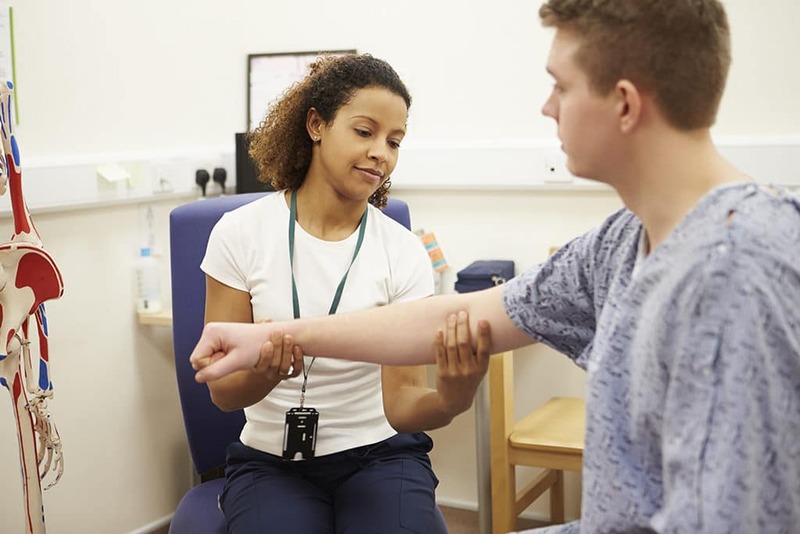 Your physician must certify your outpatient physical therapy services, which include a variety of rehabilitation activities and involve a lower level of supervision and medical assistance. 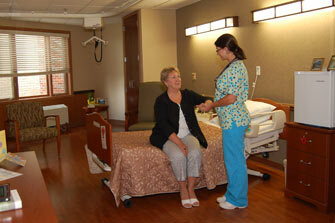 After your discharge from a hospital or inpatient facility, your doctor may recommend acute care at home. During acute home-based physical therapy, therapists come directly to your home and work on exercises that are designed to stimulate and strengthen your muscles while retraining your healthy brain tissue. What Inpatient And Outpatient Program For Stroke Recovery Is Best For You? How Do I Find the Right Physical Therapist? Though your doctor will decide which rehabilitation option is best for you, you and your family have the option of choosing your own physical therapist. You don’t need a physician’s referral to access a physical therapist’s services through direct access, but your insurance provider should tell which ones are in your coverage network. Of course, you can’t always tell exactly what to expect from a new therapist based on your first meeting. Because it’s important to maintain consistency in your physical therapy regimen and start effective exercises as soon as possible, it’s important to rule out people and programs that will be incompatible with you or unaccommodating of your needs and symptoms. 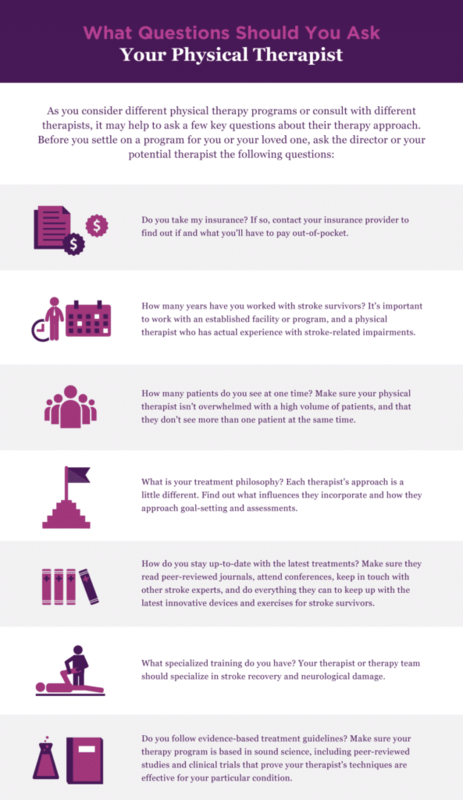 What Questions Should You Ask Your Physical Therapist? Do you take my insurance? If so, contact your insurance provider to find out if and what you’ll have to pay out-of-pocket. How many years have you worked with stroke survivors? It’s important to work with an established facility or program, and a physical therapist who has actual experience with stroke-related impairments. How many patients do you see at one time? Make sure your physical therapist isn’t overwhelmed with a high volume of patients, and that they don’t see more than one patient at the same time. What is your treatment philosophy? Each therapist’s approach is a little different. Find out what influences they incorporate and how they approach goal-setting and assessments. How do you stay up-to-date with the latest treatments? Make sure they read peer-reviewed journals, attend conferences, keep in touch with other stroke experts, and do everything they can to keep up with the latest innovative devices and exercises for stroke survivors. What specialized training do you have? Your therapist or therapy team should specialize in stroke recovery and neurological damage. Do you follow evidence-based treatment guidelines? Make sure your therapy program is based in sound science, including peer-reviewed studies and clinical trials that prove your therapist’s techniques are effective for your particular condition. Physical therapy and stroke recovery is a key component in the long recovery journey back to a “normal” life. Choosing the right program and setting the right goals are not decisions to be taken lightly. Be sure to communicate your needs and feelings so you end up with the facility and program that best fits you. Recovery can sometimes take a long time so getting the right people on your “team” will help the process. Whether you are a caregiver, occupational therapist or even a stroke survivor yourself, Saebo provides stroke survivors young and old with access to transformative, life-changing products. We pride ourselves on providing affordable, easily accessible, and cutting-edge solutions to people suffering from impaired mobility and function. We have several products to help with the stroke recovery and rehabilitation process. From the SaeboFlex, which allows clients to incorporate their hand functionally in therapy or at home, to the SaeboMAS, an unweighting device used to assist the arm during daily living tasks and exercise training, we are commitment to helping create innovative products for stroke recovery. Check out all of our product offerings or let us help you find which product is right for you. All content provided on this blog is for informational purposes only and is not intended to be a substitute for professional medical advice, diagnosis, or treatment. Always seek the advice of your physician or other qualified health provider with any questions you may have regarding a medical condition. If you think you may have a medical emergency, call your doctor or 911 immediately. Reliance on any information provided by the Saebo website is solely at your own risk. Need Help with Stroke Recovery? Stroke Survivor Gives His First Thumbs Up! Sign up to receive new product updates, clinical news, research and more. Our Guarantee: We are proud to stand behind our products with a 100% satisfaction guarantee. Learn more.